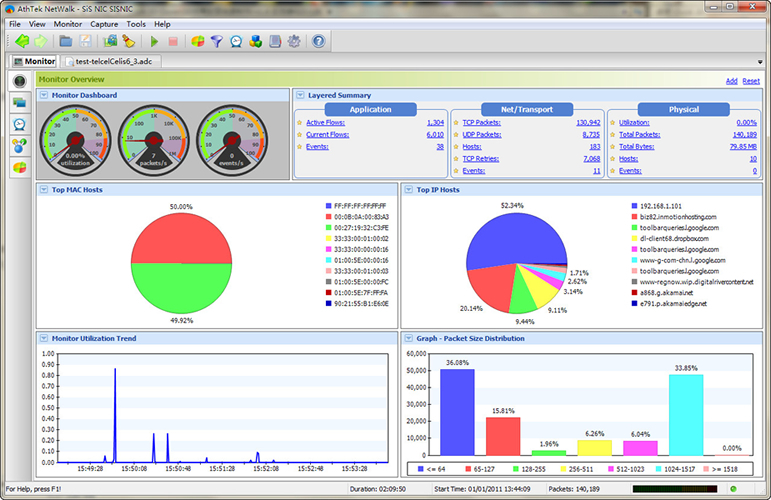 AthTek NetWalk is widely used for enterprise network management. It take advantages of Wireshark and achieve better performance. Both experienced and new user can easily handle it in network monitoring, packet sniffing and traffic analyzing. Built-in traffic filter enables network administrators to trigger alert specified communications, even to cut off them. What other network analyzer cannot do, AthTek NetWalk perfectly supports IPv6. ...... project the network state in statistical and graphical format. Network administrators can easily get the traffic details from diagrams. Built-in packet filter can help you a lot with intrusion detection, all protocols are supported. AthTek NetWalk V2.0 perfectly supports IPv6, and get an integration with Wireshark which enables a better packet sniffing performance in network monitoring. If you are facing problems of P2P communications monitoring, intrusion detection or network troubleshooting, we recommend to use AthTek NetWalk for a solution. AthTek NetWalk supports almost all kinds of network protocols and provides an easy way to monitor peer to peer file sharing. You can find many built-in filter models in AthTek NetWalk, including Bittorrent, Emule, MSN, Yahoo messenger, etc. AthTek NetWalk is also professional at packet sniffing. It will help a lot with intrusion detection and network troubleshooting. Offers comprehensive scanning and eradication, centralized management. Altova XMLSpy is the industry-standard XML development environment. Loan and mortgage amortization tracking tool suitable for business use. Altova MapForce is a graphical data mapping, conversion, and integration tool. Business Process Mapping Software Product for mapping information flows. Excel Server is an easy tool of MS Excel networked. Qweas is providing links to AthTek NetWalk Enterprise Edition 2.1.32 as a courtesy, and makes no representations regarding AthTek NetWalk Enterprise Edition or any other applications or any information related thereto. Any questions, complaints or claims regarding this application AthTek NetWalk Enterprise Edition 2.1.32 must be directed to the appropriate software vendor. You may click the publisher link of AthTek NetWalk Enterprise Edition on the top of this page to get more details about the vendor.